The Oriental Bazaar had its beginnings back in 1916 (Taisho 5), with the opening of a small antique shop. Overseas customers began visiting the shop to catch glimpses into the everyday life of old Japan. 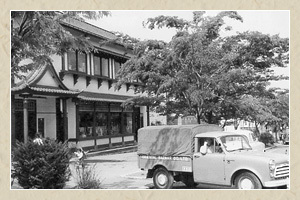 In 1951, when the scars of World War II had yet to heal, we moved to our current location in Omotesando. We reestablished ourselves as a souvenir shop for the residents of Washington Heights, the neighboring U.S. Army barracks. Thus began our official history as Oriental Bazaar. The exterior of Oriental Bazaar is modeled after a shrine. It was designed to portray a sense of "Japanesque" at first glance. The items we carried were beautiful, but practical and easy-to-use. We selected them in the hopes they would introduce traditional Japanese culture pleasingly into the lives of our customers. Oriental Bazaar's most popular items were often sold out. Notable were our original lamps, with ceramics bases from all over Japan, and our uniquely Japanese screens. Some of these articles are still decorating foreign embassies in Tokyo. From the chaotic period after the war to the present, we have had our share of laughter and tears. Yet our vision and stance remain unchanged from when we first opened our doors in Omotesando. We still hope to enrich your lives with Japanese culture and traditional items passed on through generations. Though we have never actively promoted ourselves, the name "Oriental Bazaar" has spread from customer to customer. It delights our hearts to welcome so many people from different corners of the world into our store. Your smile as a customer is an inspiration for Oriental Bazaar. Deeply grateful for your enduring support, we strive to remain a place that people always love to visit. Our strong connection with our customers stands behind the name "Oriental Bazaar." In fact, it was a customer who actually thought up the name. It happened shortly after our relocation to Omotesando, during a conversation between the original owner and a customer from the United States.